Is there a better alternative to To MP3 Converter Free? Is To MP3 Converter Free really the best app in MP3 category? Will To MP3 Converter Free work good on macOS 10.13.4? Automatic Output Settings - Analyzes bit rate, sample rate and channels of input files and apply optimal settings to output MP3s. Choose between Peak and Loudness normalisation methods. Manage target level for Peak normalisation between -20.0 and 0.0 dBFS. Choose target level for Loudness (EBU R128) normalisation between -25.0 and -5.0 LUFS. Automatic Volume Control makes speech records more clear and hearable. 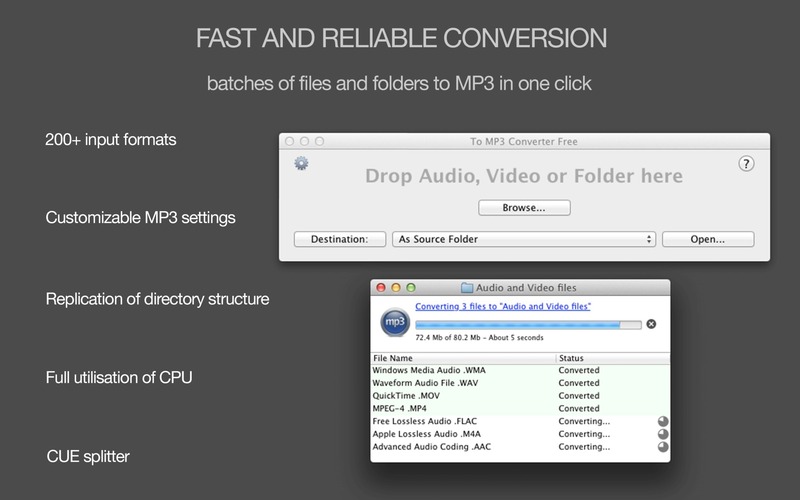 To MP3 Converter Free needs a review. Be the first to review this app and get the discussion started! To MP3 Converter Free needs a rating. Be the first to rate this app and get the discussion started! Sound Normalizer - It enhances too-quiet audio files -- or sections such as music, speech, records, and voices in movies’ soundtracks -- automatically. Extract All Audio Tracks From a Video - Extracts every audio file from a movie. Premium-features subscription is available for a monthly or annual fee (in-app purchase).